Looking for the best travel boots for your upcoming trip? This guide has you covered! I’ve put together all of my choices for cute and comfortable travel boots – everything from riding boots, to ankle boots, and even rain boots. Versatility – find a boot that will go with most of your travel outfits. The right boots will pair perfectly with skinny jeans, dresses, and skirts! Simplicity – try to look for travel boots without tons of zippers or metal embellishments. This will make going through airport security much faster. A Low heel – even if you have TSA Pre-Check, you’ll have to remove boots that have a tall heel when you go through security screening. With a flat boot, you can keep them on, and of course they’ll be more comfortable for walking around once you reach your destination. And if you’re looking for walking shoes for a trip to Europe, I’ve got a whole post with my best stylish picks. You can never go wrong with a classic, tall riding boot, especially for travel. A low heel means that they’ll be comfortable for walking around your destination, and many riding boots are statement pieces on their own, so your outfits will need fewer accessories. For more ideas on how to streamline your accessories when packing, check out this post. My number one pick for riding boots has to be these, because they come in tan, chocolate brown and black. So no matter what sort of color palette you’ve picked for your travel capsule wardrobe, there will be a great option! They’re also reasonably priced, and the brand is known for making comfort a priority. More choices? Check out these Beautiful suede boots in brown or black, more gorgeous suede in gray, and a classic riding boot that would last for years. Ankle boots are the best kind of travel boots, in my opinion. Super stylish, easy to dress up or down, and of course – really comfortable! In a pinch, they’ll usually fit in a suitcase, too. I have these ankle boots in the “charcoal” color, and truthfully, mine should have their own passport at this point. I have worn them in so many different places! They’re a bit of an investment, but I’ve had them for four years now. The cost-per-wear has got to be in the single-digits. Looking to spend less? Check out these ankle boots. They’re less than $30 and look almost exactly the same! Both of the boots above are perfect for travel because of their taupe color and low heel. I wear them with black jeans, white jeans, leggings, and even skirts. For more options, I love the gold heel on these (bling! ), and I wish I could have these, too. Moto boots are everywhere right now, and they’re perfect for travel. Why? Because they’re comfortable and go with pretty much everything. 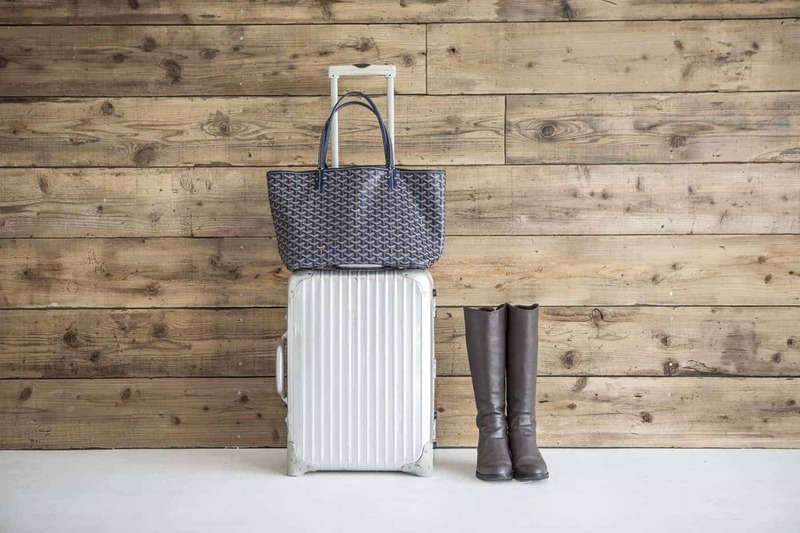 With a pair of Moto boots on, you don’t need much more in terms of accessories, so the rest of your suitcase will be that much lighter. Check out these Moto boots which are a really classic style. They’d go with anything in your suitcase! Another idea is these which are a steal at under $50! The only thing to think about if you’re trying to find Moto travel boots is that many of the styles have a lot of buckles and zippers. Keep in mind that you’ll probably have to remove them when you go through airport security. If you’re heading for rainy weather, you’ll want to make sure that your travel boots are rain-ready. Travel rain boots usually come in two different styles: water-resistant fabric, or rubber. For water-resistant boots, you can’t go wrong with this style. I can personally vouch for the fact that they are, in fact, water-resistant! I’ve trekked through rain with them more times than I car to admit, and they still look good as new. They’re part of my business travel capsule wardrobe for a reason! Water-resistant boots are typically more expensive than regular boots, but here’s another option that’s under $100 (in black). Rubber travel boots are another option! The great thing about rubber travel rain boots is that they’re usually foldable. By folding them, they’ll be easier to pack, and won’t take up as much space in your suitcase. This pair is simple and chic and less than $40! For more help packing if you’re rain-bound, check out my guide to packing for rainy weather – it’s got everything you need to know, and all of my tips that are specific for travel to rainy destinations. The first rule of packing boots for travel? Don’t pack them! If you’re planning to bring boots with you on your trip, make sure to wear them on the plane. They’re the perfect staple for a long haul flight outfit. I once wore my brown riding boots all the way from Los Angeles to London because they wouldn’t fit in my bag and I couldn’t stand not bringing them (true!). In fact, this is one of my main tips for packing – which is to always wear your largest shoe on the way there and back. Again, I try to look for boots that are easy to take on and off so that I’m not tripping all over myself at airport security. 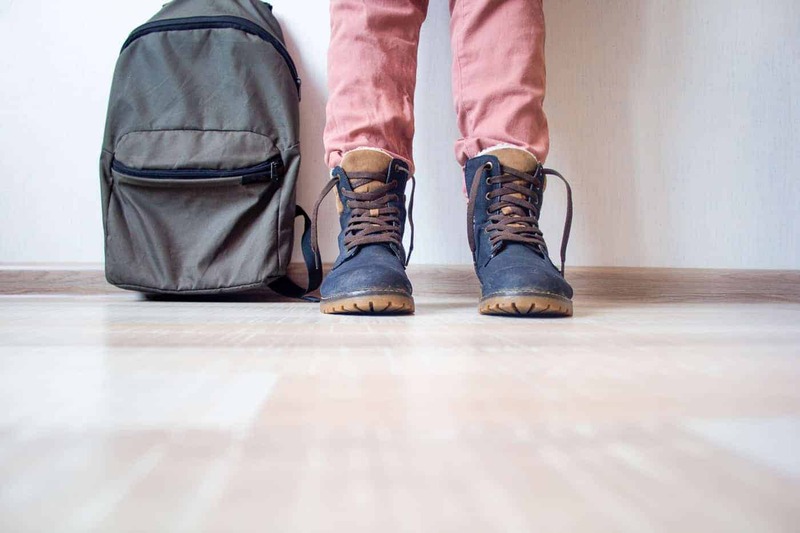 If you must pack your boots: use them as storage for your other smaller clothes – socks, tank tops, etc. This will maximize your packing space and keep the shape of your boots as well. Once you’ve found the best travel boots for your trip, you’ll probably need a second pair of shoes. I’m a firm believer that you can pack for any trip with just two pairs of shoes. Need a second pair of shoes for your trip? Check out my posts in the perfect flat shoes for travel, as well as the best sneakers for travel! Got your shoe picks all set? 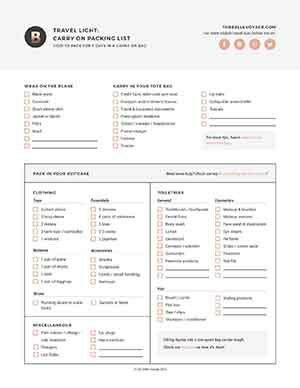 Check out my printable travel checklist – it’s got everything else you might want to pack! There you have it, all of the perfect travel boots for women!